With its very first release of Nissan Pulsar in 2014, company very well announced its intentions to steal the growing hatchback market. By the time released model gains its cup of coffee company came with its new concept, Nissan Pulsar NISMO Concept 2014, call it a performance version of the hatchback at the 2014 Paris Motor Show. Though the model with its aggressive exterior and race inspired interior gained eye-balls upon its day of release but being a car lover a thorough sneak inside is what we definitely deserve. Let’s have a look inside and see what the NISMO badge has added to this Nissan Concept. 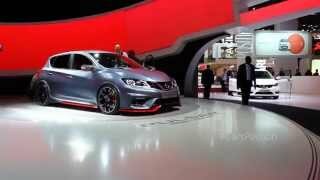 Calling the interior of Nissan Pulsar NISMO Concept 2014 a race inspired one, knocks inside your brains the very first perception of using the contrast of red and black. We happily acknowledge the true guess. The red and black accents not just covers entire interior (as in the one use to sit or accommodate things) but the technological parts like the gauge cluster too gets the revive of red and black in it. Second to gain your attention in interior of Nissan Pulsar NISMO Concept 2014 are its bolstered sports seats wrapped all over in Alcantara and leather while the three spoke steering wheel hiding behind alloy paddles makes its remarkable presence of dashboard. The entire cabin upon several places finds inserts of aluminum and carbon, making this hatch a not so regular hatchback from the house of Nissan Pulsar. 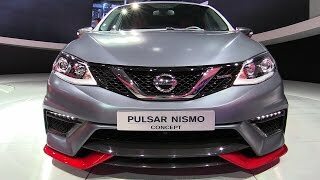 The exterior of Nissan Pulsar NISMO Concept 2014 is far more aggressive than the base Nissan Pulsar, s for those missing looks in their regular hatchback; you have a treat to come with this model. First thing’s first, the all new bumper seating beneath the hood holds large air intakes and brake cooling vents of size competing. Complimenting these are the beautifully designed apron and splitter and these all gets artistically aggressive with the 19” five spoke wheels when looked from side. 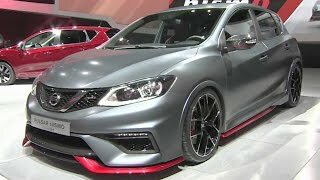 Moving to the rear fascia of Nissan Pulsar NISMO Concept 2014, first thing to drag your attention is a centrally located two faced exhaust system getting complimented by a carbon-fiber created spoiler. Both of these when combined with the entire grey colored body, accented by red brake calipers and black painted chrome trim over windows, makes the Pulsar NISMO Concept 2014 aggressive enough to rob the attention over streets. 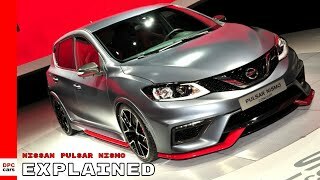 Till date there is no word upon the performance of Nissan Pulsar NISMO Concept 2014 but looking at its aggressive exterior and sporty interior, hatchback is expected to bring somewhere around 250 horsepower beneath its hood.